We didn’t originally plan to have another preview. However, we implemented a few significant chunks of functionality and were dying to get feedback so that we could incorporate it into the product before Beta. It helps that with five or so of these interim releases, we’ve become pretty efficient producing these releases. We plan to have our next release be our official Beta, which means we’ll have a lot more test passes to produce and run before we release the next one. Brad Wilson wrote about changes to partial rendering and view engine in preview 5. Maarten Balliauw wrote about easier form validation with preview 5. It looks like that they removed the sealed keyword from many of the Attributes such as HandleErrorAttribute, AuthorizeAttribute and various other existing Attributes. However, looks like many of the other attributes (some new, some not) such as AcceptVerbsAttribute, ModelBinderAttribute and NonActionAttribute are still marked as sealed. Guys, please unseal all your stuff. If you have a very, very, very valid reason then fine seal them. But if not, let developers loose and unseal them. I've looked this up twice now so I'm posting it to my blog for future reference and as a quick-tip for others. Say you got a web page with a dropdown/select listbox and you want to reload/auto postback the page when the selection changes. As you can see, the htmlAttributes parameter is available on many of the Html-helper methods and I'm using ot to add a name attribute to the HTML form as well. 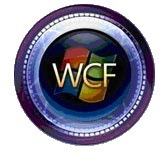 How about REST WCF bits from .NET 3.5 SP1? Is it possible now to let the user decide in which format he wants the response (xml or json) like MySpace API for example? First go take a look at the sample that Kirk Evans had on his blog. Note that it may be easier to create a RESTful interface with ASP.NET MVC if you're into that tech, but that's another blog post. I think he's got a point there actually. Web services with WCF can be very easy to use, and it can be so very complex it'll get your head to spin. The REST and POX/POCO style of services is definitely getting more attention, even from within Microsoft. WCF now supports RESTful interfaces, and we've seen REST-related demos by well known Microsoft presenters several times now, especially around WCF, EF and Astoria/ADO.NET Data Service. Also, it's very easy to create a RESTful service with ASP.NET MVC. We saw several REST-related presentations at Mix07 and Mix08 and I'm sure there will be a lot of REST/POCO/POX/Atom demos at PDC later this year. Version 2.0 of SyncToy has been released on MSDN Downloads. SyncToy does not replace FolderShare for syncing files between different computers, but is a more effective way to copy/move/sync files on your computer. The dev-team uses the tool primarily to move pictures and music from devices (cameras, mp3 players etc) to folders on their computers or network shares in a more effective way. It's not a service/system tray kind of thing, just a utility that remembers a number of different "syncs" you've setup so that you can run them again and again when you need to. SyncToy, a free PowerToy for Microsoft Windows, is an easy to use, highly customizable program that helps users to do the heavy lifting involved with the copying, moving, and synchronization of different directories. Most common operations can be performed with just a few clicks of the mouse, and additional customization is available without additional complexity. SyncToy can manage multiple sets of folders at the same time; it can combine files from two folders in one case, and mimic renames and deletes in another case. Unlike other applications, SyncToy actually keeps track of renames to files and will make sure those changes get carried over to the synchronized folder. SyncToy is built upon the Microsoft Sync Framework, which seems to get better and better all the time. Worth keeping an eye on for everyone involved in developing applications which requires replication or off-line modes. This video has been around for a few months now, but it's still cool. It's not one of Bill's better demos as he's kind of standing in the way of the screen all the time, but it still shows off the Touch Wall/Surface capabilities pretty well. I'm sure we'll see something like this in class rooms and larger meeting rooms in the future. It's easy to learn to use, but the presenter will have to learn how move on the podium as well as work with the presentation and give the talk. Interesting... what do you think? The video sequence is from the Microsoft CEO Summit 2008. I must be daft, I completely missed this free add-in from Microsoft to be able to save as PDF (and XPS) for Office 2007. It's been around for years... duh. 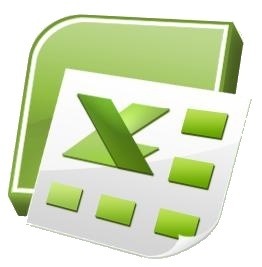 And now to something completely different... the Excel automation. Every now and then you need to open up an Excel file and do stuff with it. In this case we needed to create and read from named ranges in Excel, and it's not overy easy to get information about how to do that, so I thought I might as well post some sample code here. Now, here's a console app in .NET 3.5 using VB.NET (I prefer to work with VB.NET with Office Interop and VSTO), which opens Excel, adds a new workbook, creates a (3,5) string array with values, fills the a range with these values, creates a named range and gets the values again to see that it worked properly. 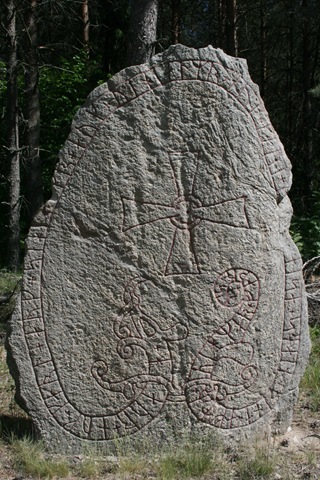 This is totally off topic from the things I usually write about, but I thought I might show some pictures of a few beautiful rune stones we have scattered around not far from where we live (Botkyrka, southern part of Stockholm, Sweden) and tell you something about this particular type of landmark the Vikings left us. My knowledge of rune stones and runic inscriptions are minimal and I may get some info slightly wrong here, so bear with me :) I'm sure Wikipedia got tons of info on the topic if you hunger for more. The typical rune stone is a raised stone with runic inscriptions on it, but it also happens that you run across runes inscribed on bedrocks. It seems that the main purpose of these stones where to mark important events, explain inheritance, boast about the construction of a bridge or a road and very often to bring glory to kinsmen who travelled far and (quite often) died in foreign lands. 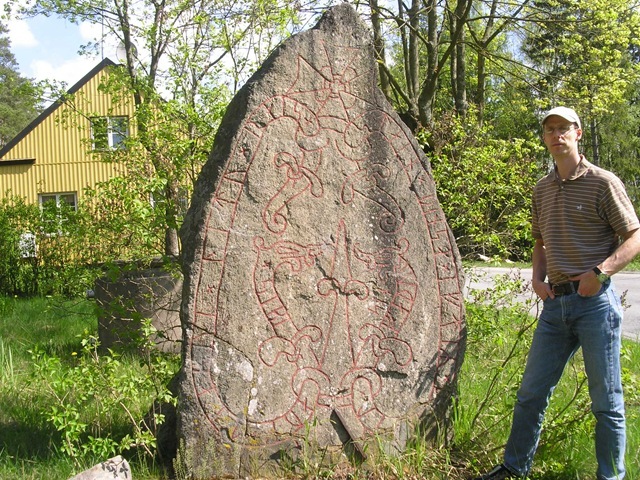 Most rune stones are located in Scandinavia (Sweden, Norway, Denmark, Iceland), but there are also a few in locations where the Scandinavians of that time (mostly Norsemen) went, like England, Greenland and Ireland. What's so cool is that most of these stones were carved and erected during the Viking Age (from around year 790 to 1100), and thousands of these stones still stand where they were erected more than a thousand years ago. Some stones have been moved from where they were first found to a place close nearby where they are more accessible to folks who are interested in them. Through the years stones have been destroyed by construction, stolen by collectors and damaged by air pollution but still there are over 6.000 registered rune stones or fragments of them around, most of them (over 3.000) are located in Sweden, and most of those in the province of Uppland on the eastern coast of Sweden, just north of Stockholm. 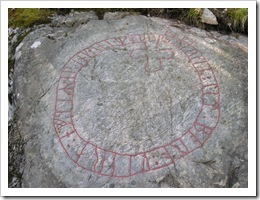 In Sweden, most of the stones are kept in a healthy state and looked after by a state organization. 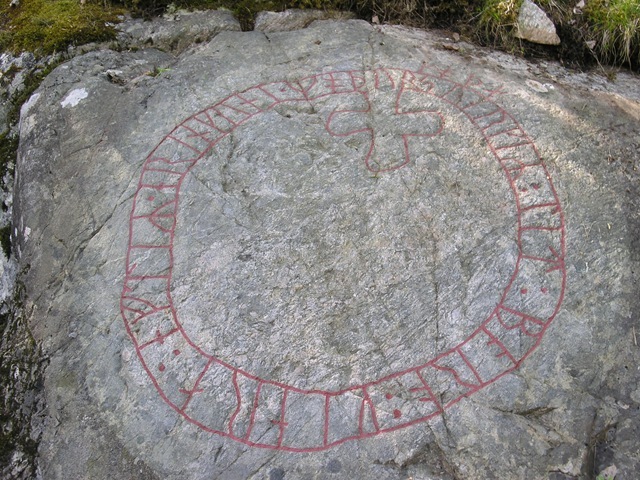 These people remove lichen and sometimes paint the runes with red paint, which is believed to be the most common color used. There are stories of runes being reddened by blood, but that's probably just that - stories. 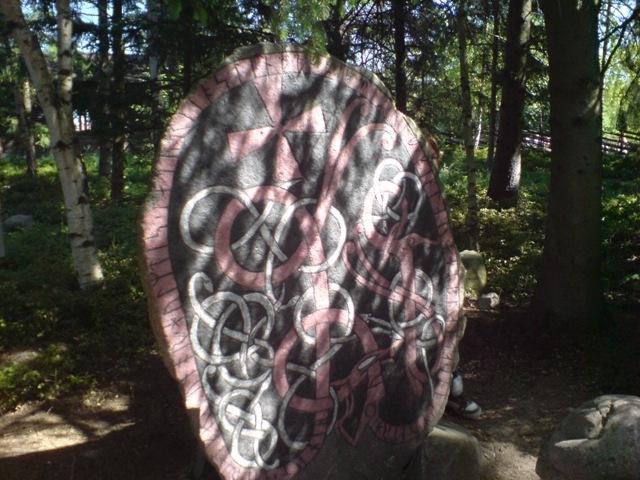 The rune stone above to the right is called "Ölsastenen", found in Uppland but moved to Skansen, an open air museum and zoo located in the middle of Stockholm. It is painted in (probably) authentic manner. That picture I took with my mobile camera, so the quality is quite bad. 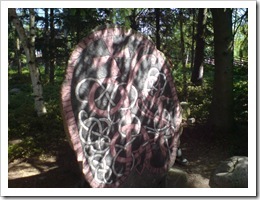 If you ever visit Stockholm and want to see a few rune stones, Skansen is probably the easiest place to go. 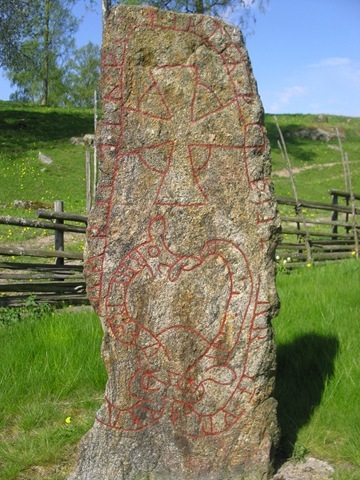 Most of the rune stones in the Uppland area have a Christian cross carved into them, showing they were of the Christian faith or supported a Christian king. This picture I took with a somewhat better camera and show the stone at Hamra (Sö 289). It reads "Björn and Holm--- erected this stone after Kättilbjörn, their --- God help the soul". Some carvings cannot be clearly read as you can see. 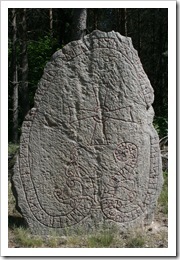 This is the stone at Uringe (Sö 298) and reads "Håur and Karl and Sighjälm and Vihjälm and Kåre erected this stone after Vigmar, their father". How nice of them! The stone is over 1000 years old. 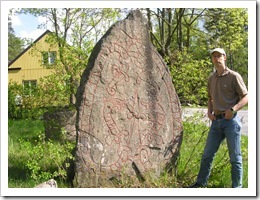 To get an understanding of the size of some of these stones, here's a picture of the stone at Uttran (Sö 305) and myself. 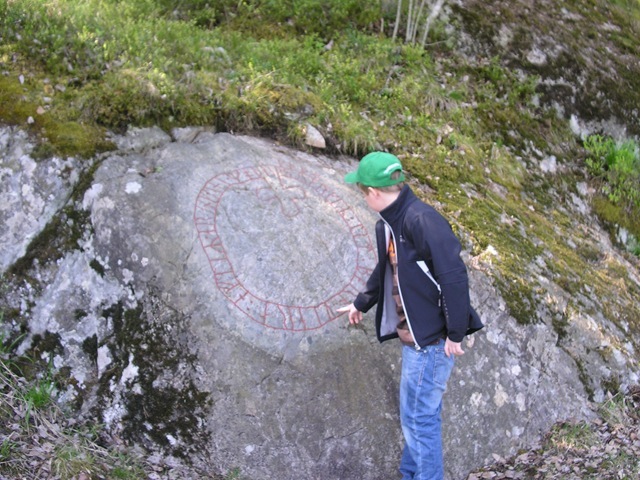 The picture is taken by my son Pontus and a rune stone excursion we did earlier this summer. 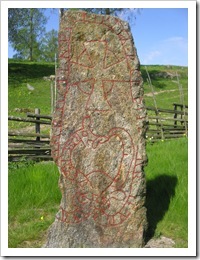 This stone was erected by two brothers and reads "Sibbe and Tjarve erected this stone after Torkel their father". 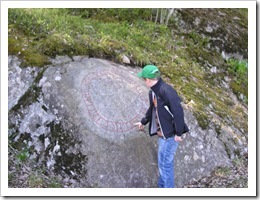 The pictures above show the bedrock carvings in Glömsta (Sö 300), just 5 minutes from where we live. This rune stone is a bit special because it's dedicated to a mother: "Sverker built the bridge after Ärengunn, his good mother". The bridge Sverker mentions is probably not a bridge over water, but rather improvement of the (what is believed to be an important) road that passed by this very place. So to honor his mother, perhaps he inherited lands from her, Sverker had this road improved and let everyone that used it read about this. 1000 years ago. I know, it's not like wall paintings in pyramids, but still cool. Windows Live Writer - a wonderful tool from Microsoft for writing and managing your blog posts. I'm using it now and will probably use it for a very, very long time. It's that good. µTorrent - a pretty good bit-torrent client that just works. Fiddler - web debugger by Microsoft (written by Eric Lawrence I believe) that will help any developer who's into AJAX, REST, ASMX, WCF, plain HTML or whatever project that involves sending stuff over HTTP. Paint.NET - not as good as Photoshop, but not far from it and free! Written in .NET, this wonderful program gets new features every week it seems. Was #19 on PC World "Top 100 Products of 2007". Foxit Reader - a light weight, free, alternative to Adobe Reader for reading (and annotating) pdf files. I wish I could replace all programs from Adobe like this, man how I hate the extra junk Adobe installs on my machine. I just want to be able to read PDF files... same call goes to HP while I'm at comapnies that install "things" that bogs down the startup of my laptop. TortoiseSVN - the "The coolest Interface to (Sub)Version Control". I use this to get open source projects, like IronRuby and ASP.NET MVC. The Windows Explorer integration is really nice. TrueDownloader - open source download manager I've been using for a while now. As with uTorrent above, there are loads of download managers out there, but this one works and has no banners or ads. FolderShare - from Microsoft, and it's one of the coolest free tools you can get your hands on. Keep files in sync across your computers, share folders with friends and access your files from any computer. And it works :) If you haven't used this program yet, give it a try. I use it to backup source code and documents between 3 computers. Daemon Tools - 'nuf said! Expresso - a powerful tool to help you write regular expressions. Requires a registration code after 60 days, but it's free. NUnit - one of the most frequently used unit test frameworks for .NET out there. PostSharp - an aspect oriented programming "weaver" for .NET which plugs in to visual studio and MSBuild. PostSharp is a great tool for doing AOP weaving in .NET, if you need it that is. Read up on AOP before you go there, most times there are other options. ReSharper - the number one addin to VisualStudio ever written. If you're a c# or vb.net developer, this is the one tool you should learn to use. There is so much to say about this work of art from the JetBrains, but it makes you way more productive and it helps you become a better programmer. Moq - a mocking library for .NET which takes good advantage of .NET 3.5 with linq- and lambda expressions. My mock library of choise! PowerShell and PowerTab - if you're a powershell user and also a .NET developer, make sure you install powertab by Marc van Orsouw (the powershell guy), which is an extension to powershell that gives you tab-expansion for the .NET library. To get an understanding of the power (heh) of this, check out this DNR-TV episode with Scott Hanselman. Reflector - aw, you know this one already! This is a now legendary tool by Lutz Roeder. Kirk also describes how to use the Fiddler tool to send REST request to the service, which is a wonderful tool for these circumstances. NOTE: Remember that you must add a HTTP header, specifying the content type, or the POST request will fail (Content-Type: application/xml). Note that the DataContractSerializer is still picky about the XML it gets to be able to deserialize it properly. Again, to get a more "relaxed" REST interface where WCF accepts the Name and ID nodes in any order, use the XmlSerializerFormat. I'm not sure this is what you want, but it's an option. There are ways to send and receive any XML to a RESTful interface with WCF, and I'll write a blog post about that another day. Wow, I've finally spent some time looking at Silverlight and WPF samples, and it sure takes a while to wrap your head around "The XAML Way of Doing Things". It's so easy to fall back to the WinForms coding style when you're supposed to do it The XAML Way. For example, if you have an options dialog with user settings for your app - DON'T do it the old WinForms way, but look at Configuration with Databinding (from Scott Hanselman's adventure with BabySmash). The code behind you need is really minimal if you do it the right way. There are also a gazillion ways to handle control events declaratively within the XAML itself, without having to create a code behind event and code things up from there. Take a look at WPF Styles and Triggers and learn it! Especially if you want to create nice looking effects, animations and such, but styles and triggers are useful for more than bells and whistles. For many things related to the UI there are 2 ways of doing it - in XAML or in code behind. There's a pretty good starter on Styles and Triggers on the Microsoft Belgium MSDN site. It may not be wrong to do it in code behind, and some things *must* be coded that way, but always search for The XAML Way of doing it before falling into old WinForms behaviour. Finally, what will take me a long time to understand and learn (if I ever learn it) is the XAML layout manager. I'm trying to position a group of controls in the center of a WPF Window that may be in full screen mode. First I used the Canvas panel and hacked away in a WinForms style specifying location depending on screen size and stuff, but I'm sure it can all be done in XAML... somehow *smile* ScottGu wrote an intro for Silverlight 2 on the layout manager, which is good reading if you are new to this. I should probably install Expression Blend and learn at least the basics of it. The XAML editor in VS2008 is just not enough for more complex layouts. What scares me somewhat is that a fairly complex WPF/Silverlight window may result in pretty nasty XAML with a bunch of Grids, Stackpanels, Canvases, more Stackpanels within Stackpanels within a certain Grid.Column and so on. Add a bunch more if you're using triggers and animation. I know you can shrink the XAML somewhat by using Styles, but are we getting back into HTML Table Hell again when we've just been saved by CSS?